Last year Michael Avenatti surged onto the national stage like a street fighter, a bantam litigator draped in tailored Tom Ford. The 48-year-old Newport Beach lawyer seemed almost too perfect as a Trump foil: a self-made man who emerged as a champion of silenced women, namely former adult-film actress and star client Stormy Daniels. Avenatti’s television blitzkrieg—launched after a lawsuit filed on Daniels’s behalf sought to invalidate an NDA she had signed following a supposed affair with Donald Trump in 2006—provided liberals and Never-Trumpers with the sort of visceral vengeance that more civil-minded Democrats failed to deliver. “When they go low,” he declared at a Democratic National Committee fundraiser in Iowa, “I say hit back harder.” But as quickly as the myth of Avenatti had emerged, it began to unravel. Back in March, Daniels pulled a Trump and fired her attorney over Twitter. Not long after, federal investigators unsealed documents accusing Avenatti and his two law firms of fraud, extortion, and embezzlement. As part of a 197-page complaint, IRS special agents alleged years of financial crimes and tax evasion committed to support a lavish lifestyle at the expense of clients and partners. In retrospect it was no surprise that a man with a taste for luxury goods and fast cars—he competed in the 24 Hours of Le Mans as a professional racer, codriving a Ferrari with a Saudi prince—had a spending problem. Though his crimes reportedly stretch back to 2014, the most recent (and brazen) transgression took place in the last few weeks, when prosecutors claim Avenatti tried to extort Nike for more than $22 million. Shortly after he announced a press conference on Twitter, federal agents arrested Avenatti in front of the apparel giant’s legal offices. He posted $300,000 bail. This week, even when his Icarian descent seemed complete, a Santa Ana grand jury leveled 36 counts of fraud, perjury, failure to pay taxes, and embezzlement against Avenatti. Most damning of all is the charge that the charismatic attorney stole millions from his own clients—including a Los Angeles man living with mental illness and paraplegia—lying to them about the status of their money. Once a hero of the #Resistance and a dark horse presidential candidate, he’s now on his way to becoming as reviled as the man he pitted himself against. 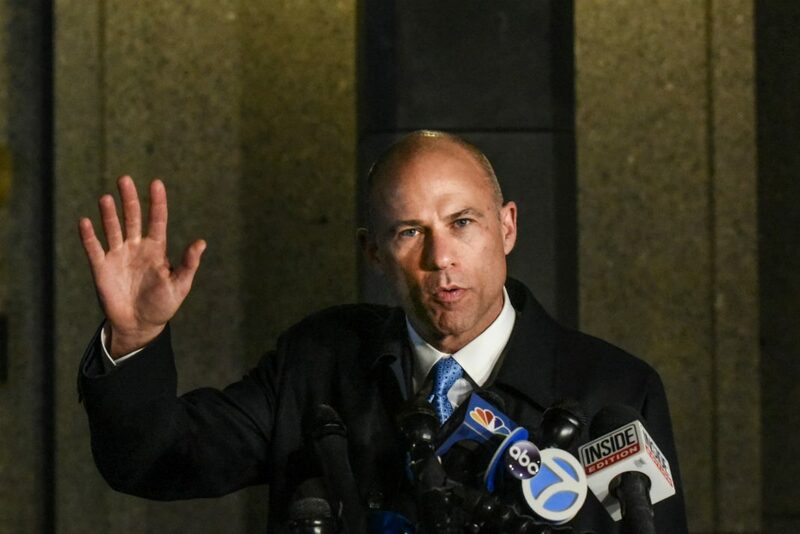 With Avenatti’s trials set for late April, one number is still up in the air: How many years could the disgraced barrister spend behind bars? Amount Avenatti claimed to have recovered in verdicts. Avenatti & Associates’ Reported earnings from 2011 to 2017. Funds deposited into Avenatti & Associates accounts from 2013 to 2017. Number of tax returns filed by Avenatti’s law firm since 2013. Number of races in which Avenatti competed as a professional race car driver. Number of races he won. Monthly cost of living expenses for Avenatti’s family, according to his wife. Number of private jets co-owned by Avenatti through his companies. Each was worth approximately $4.5 million. Cash moved from Avenatti’s coffee company, Global Baristas, into a bank account for his racing team in an alleged attempt to obstruct IRS efforts to collect taxes. Amount from a settlement that Avenatti transferred to his own bank account rather than his client’s. When his client, referred to as “G.B.” in the IRS complaint, inquired about the settlement, Avenatti told him that it had never been received. Proceeds from another settlement that Avenatti withheld from his client and spent on a Honda HA-420 private jet. Amount from a settlement between Geoffrey Ernest Johnson and Los Angeles County, which agreed to pay the mentally ill paraplegic after he alleged mistreatment at the Twin Towers Correctional Facility. Avenatti hid the money from Johnson and spent it all in over 5 months. Because Avenatti would not give information to Johnson about the settlement, Johnson lost his disability payments. Mortgage payments made on Avenatti’s former Laguna Beach home by his law firm. The 5,000-square-foot cliffside estate included a full bar, a billiards lounge, and wraparound seafront decks. Amount spent at Neiman Marcus by Avenatti’s law firm between 2011 and 2017. Estimated child support owed to Avenatti’s wife. What Stormy Daniels owes President Trump and his attorneys in legal fees after a judge dismissed a defamation suit that she claims Avenatti filed without her consent. Maximum prison sentence, in years, Avenatti would face if convicted in both the New York and Los Angeles cases.